Fight against the signs of aging with the Juvéderm collection of injectable wrinkle fillers. From treating lines and wrinkles on the face, to giving you full, plump lips, Juvéderm treatments provide beautiful, natural-looking results. Juvéderm injections, offered by Houston, TX Cosmetic Surgeon, Dr. Anthony Nikko, can be used alone, or combined with other nonsurgical treatments to meet your aesthetic needs and goals. Juvéderm injectables are made with synthetic hyaluronic acid (HA) that is designed to restore the skin's natural supply of HA and collagen for supple, healthy skin. 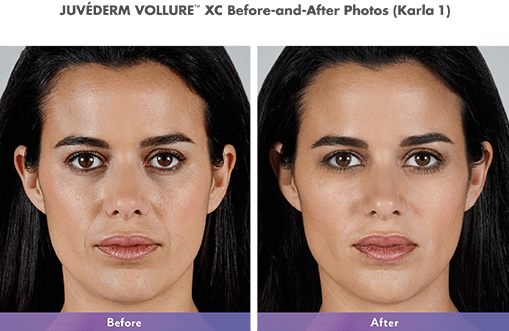 Rejuvenate your appearance without the time and expense of surgery with Juvéderm XC and Ultra XC. What is the difference between these two injectable treatments? Juvéderm XC smooths moderate to severe wrinkles on the face, including parentheses lines and other wrinkles around the mouth and nose. The results of Juvéderm XC last up to one year. 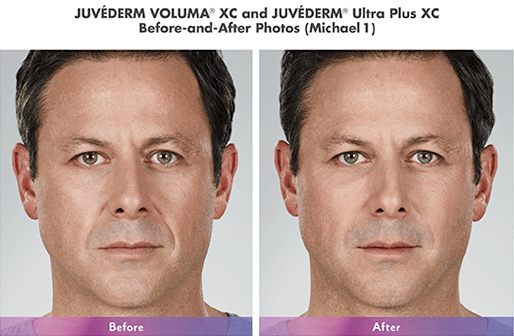 Juvéderm Ultra XC adds temporary volume to the lips in the upper lip, lower lip, or both while improving the appearance of vertical lines on the lips. The results of Juvéderm Ultra XC last up to one year. Call the Nikko Cosmetic Surgery Center today to schedule a free consult. Juvéderm injections typically only take 15 – 30 minutes depending on the number of areas being treated. The patient's face will be cleansed and injection spots will be marked. To minimize discomfort during the treatment, Juvéderm fillers contain lidocaine (a local anesthetic). After their treatment, patients can resume their normal activity, but strenuous activity, like exercise, should be avoided for at least 24 hours. Patients should avoid touching their face after their injections to avoid moving the filler into unintended areas. Patients should see an immediate improvement after their Juvéderm treatment, but they may also see mild swelling or bruising in the treated areas for 7 – 10 days after their injection. The results of Juvéderm injections last up to one year in most patients, but patients typically find that their results begin to last longer after a few years of treatments. Talk to your surgeon about when to book a touch-up or full treatment to maintain your results. To restore the youthful plumpness and smoothness of your face, schedule a consultation for Juvéderm XC and Juvéderm Ultra XC. Both Juvéderm XC and Ultra XC are part of the Brilliant Distinctions program from the Allergan company of cosmetic products. Talk to your doctor about joining the program so you can get special offers and earn free treatments.